I teach English and Speech Communication, and I dance Flamenco and study tattoo design in my spare time. Do you have ideas for tattoos? Is there a tattoo art design playing around in your head? Perhaps there are some images, a pattern or a graphic, even colors that keep coalescing in your mind. 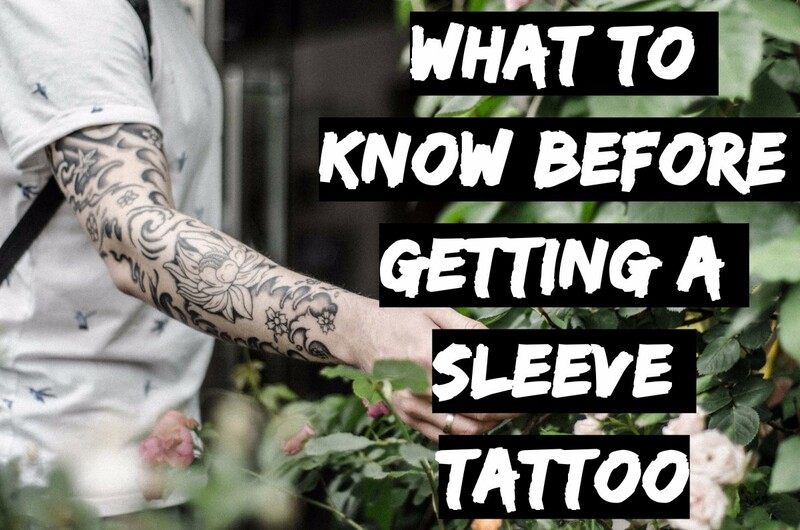 Maybe you've looked at some tattoo patterns on the internet or flash on the wall of an actual tattoo studio. You're either a tattoo person, or you're not. Most people have very strong opinions about tattooing their bodies: how much art is too much, what types are acceptable, even whether tattooing itself is ok. 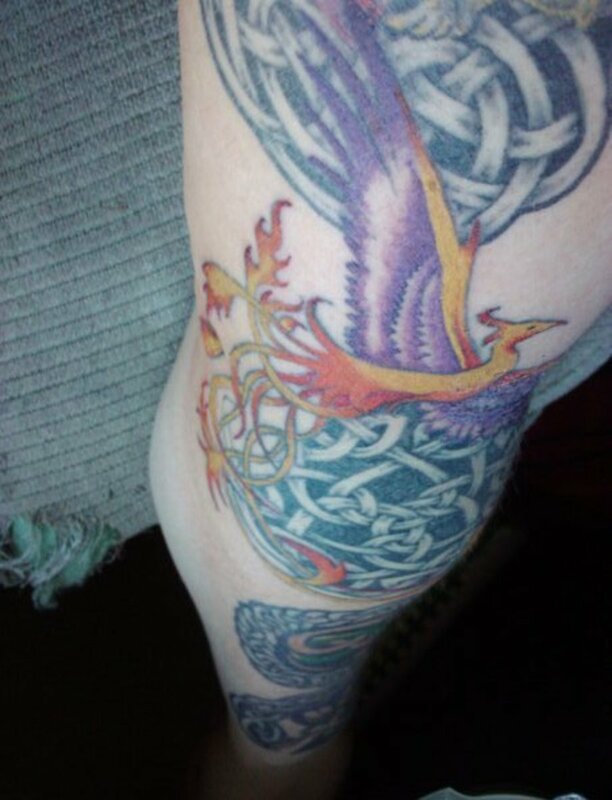 Some people are die-hards: strangely, getting a tattoo can be addicting. There's something about designing something beautiful or terrible that will permanently decorate your body. 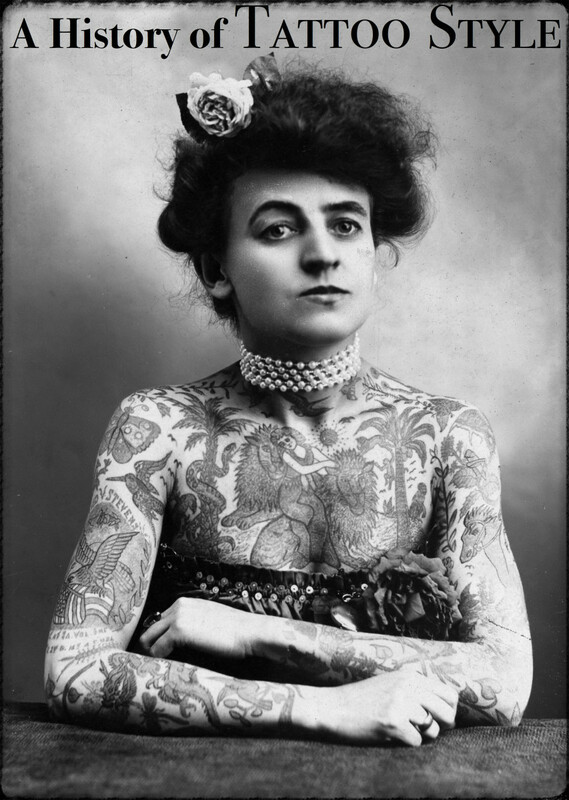 The history of tattooing stretches back five millennia. Painterly tattoos are relatively new to the scene, having been around for only a decade or so. What makes painterly tattoos different is they are designed to look like they've been painted on your body rather than outlined and colored in like a comic book. The trick, though, is that tattooing is more akin to illustrating than to painting. What art should I get? The first step to getting any tattoo is choosing what art you want to have adorn your body.Tattoo is art, which is part of the reason the painterly style is so innovative: it's taking the beauty of blended paintings and combining it with the beauty of tattoo art. People choose tattoos for as many reasons as there are people! There are good, bad, neutral and questionable reasons for choosing your tattoo art. 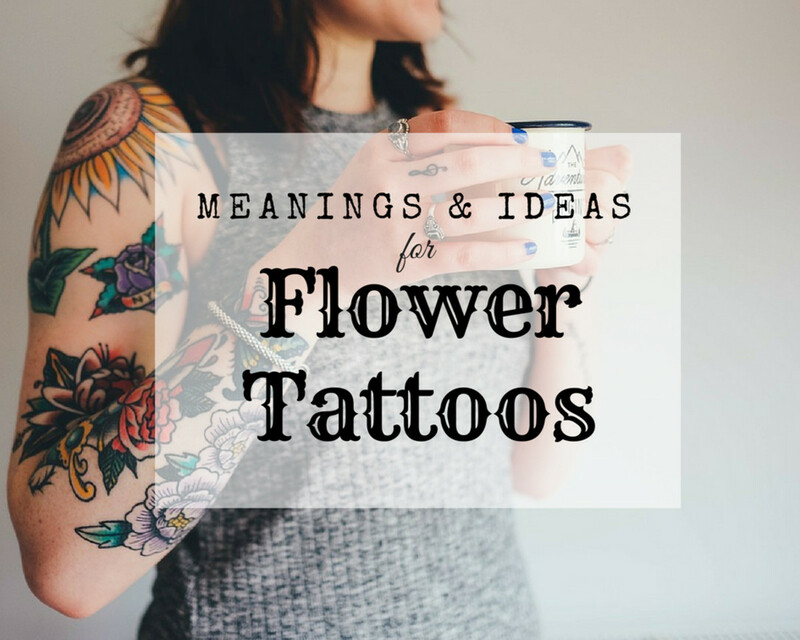 The tattoo art you choose should ultimately have some meaning for you. Certain designs have a pre-determined meaning – such as a cross, a heart or a Chinese character. You can also design an image that has personal meaning to you. I have a friend who has loved sunflowers since a trip to France in junior high, so she has a sunflower tattoo. Another friend got a tattoo to commemorate her melancholy at leaving Colorado. Another has an etching of lungs with a lobe removed to honor of her father who passed away. I designed my latest tattoo after seeing Rammstein potentially for the last time – almost likely the last time in my hometown. 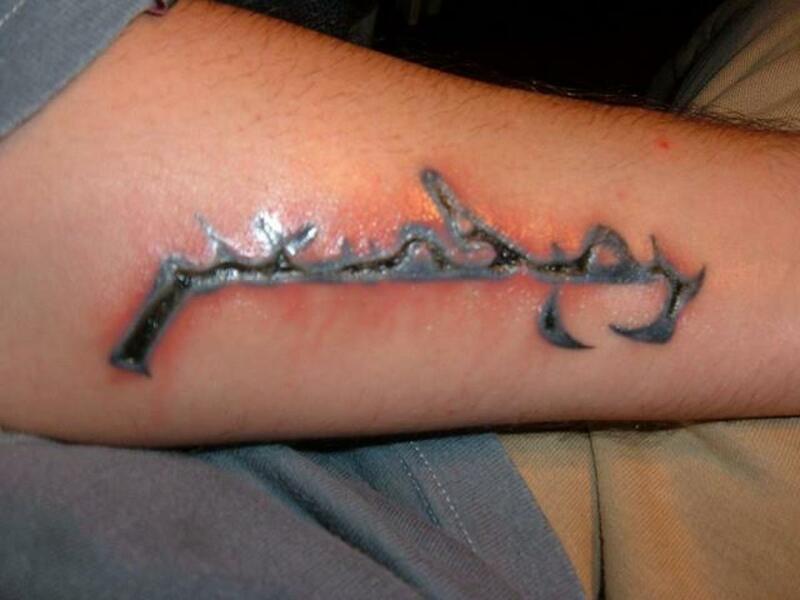 Many people have very strong feelings about tattooing names or logos on their bodies. However, Rammstein is a band I have followed for fifteen years. The art I designed has meaning to me as related to my youth. I have also had it in mind for a year. 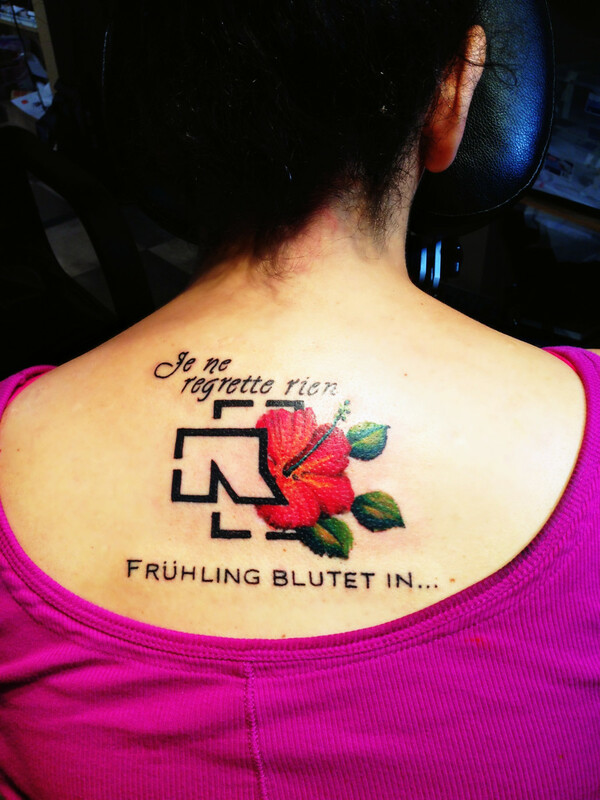 The central theme of the tattoo is "no regrets" – I know I will not regret mine. A lot of people state they choose not to get a tattoo because they don't know what to get permanently inked on their bodies; some are afraid they won't like it later. My experience has been that your tattoo becomes a part of you. At first, certainly while you're still in the maintenance stage, you're hyper-sensitive to this new aspect of your body. Probably for awhile you'll choose clothing that shows the tattoo art off, if possible. Eventually, though, it becomes a part of who you are, just as much as the color of your eyes or shape of your pinky toe. Exceptions to this are people who get regrettable tattoos. One tattoo artist who worked on me had a tattoo of Mickey Mouse igniting his farts. This man was proud of his Mickey, though, so it is not a regrettable tattoo. People regret the tattoos they get on a whim, especially while drunk. Reputable tattoo artists will not work on intoxicated people; unfortunately there are a lot of disreputable tattooists. People also regret the tattoos they get because they lost a bet. My advice: just shave your head -- hair grows back. Do people regret getting text tattoos? 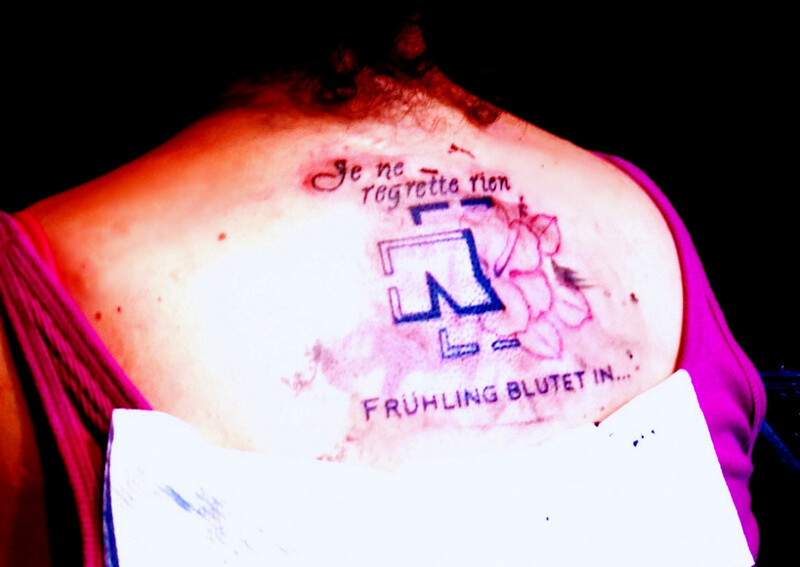 People often regret text-based tattoos. Names of significant others are tricky. You want to think your relationship will last forever, but the sad truth is the ink sometimes lasts longer. The exception to the name rule is getting the names of your children; that relationship does not end. Misspelled tattoos are hilarious – for everyone except the inked one! "I'm awesome" – not if you can't even spell awesome! As for people who accidentally get "supermarket" in Chinese inked on their bodies… there's no excuse in this day and age of Google. I chose to get text on my tattoo, words from a song. Similar to Hayden Panettiere, mine states "I regret nothing" in a foreign language. Unlike Hayden Panettiere, I checked the spelling of the French directly from the song. There is also a line in German from the same song: I copied it directly from Rammstein's album. If it's misspelled, it's misspelled the way Rammstein intended. My tattoo artist, more conscientious that Hayden's, also researched both phrases. He had me check both the stencil and the image on my body before inking the letters in. As with the rest of life, make good, thought-out decisions and you won't have regrets. What do I do on tattoo day? Do not drink alcohol. It thins your blood, so you bleed more. You are also less likely to catch mistakes before they're permanent. If you're worried about pain, take ibuprofen about an hour ahead of time. Wear clothing that will easily allow you to expose the pertinent part of your body. Tattoo studios are not as private as you might want if you're getting inked in a delicate area. Wear clothing that can get stained. You might bleed, or some of the ink might get on the clothing. Don't wear your best white linen outfit. Bring a friend, especially if you're nervous. The anticipation is the worst, so you want someone to talk to right before the needle descends on your body. They can also talk you through the pain. Eat ahead of time, especially if you're getting a large tattoo. I had a friend pass out because she was in pain and her blood sugar dropped. The artists at the studio said that happens about once a week. Bring a drink or a snack. See above. 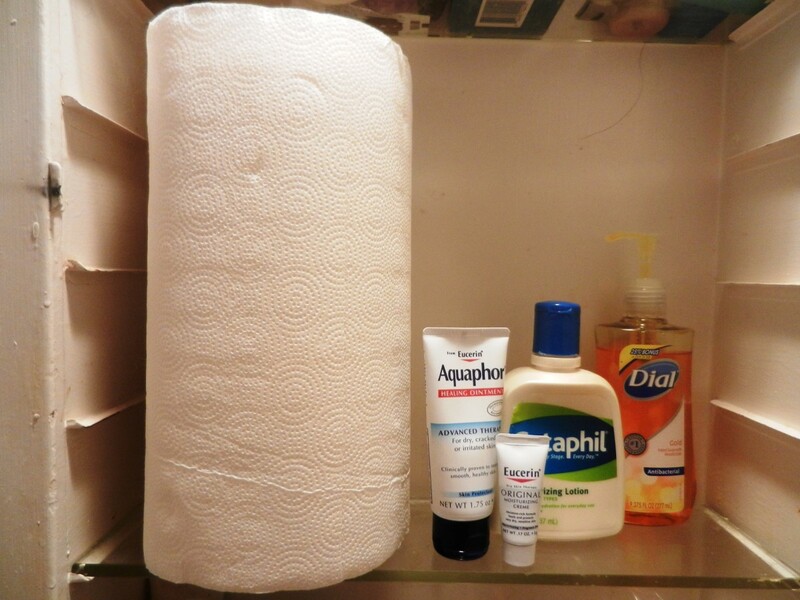 Buy your aftercare supplies ahead of time. How badly does it hurt? 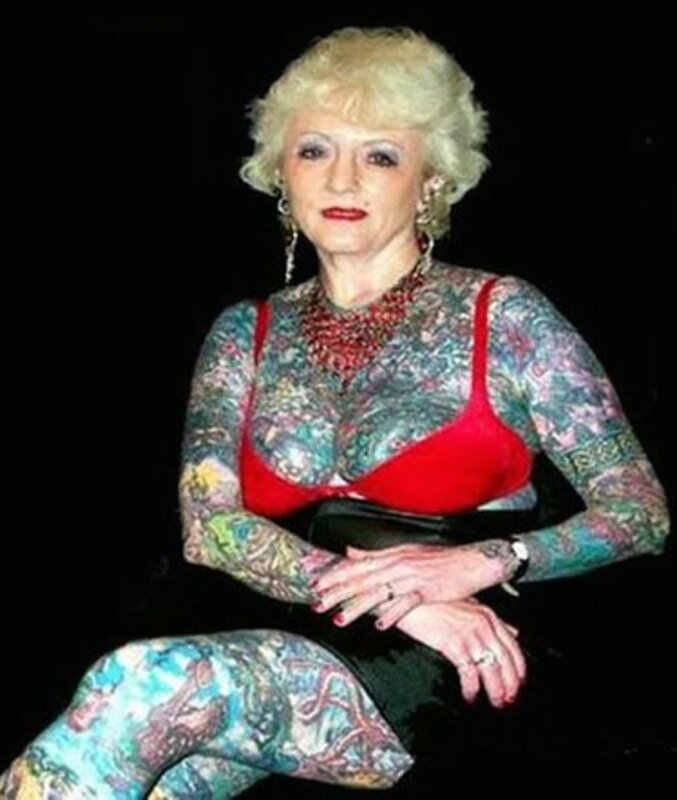 People who've never been inked wonder how much tattooing hurts. A lot of factors go into the answer to that question. If you get a tattoo on a bony rather than meaty or fatty area, it hurts worse. Ribs, hands, feet and the head are very painful spots. My tattoo artist stated the back of the knee was the most painful for him. Conversely fatty areas hurt the least – one of the few good reasons to tattoo the heiney. Outlining hurts worse than coloring in. It does for me, anyway. To me the outline feels like a cat claw scratching the tattoo pattern into my skin whereas the coloring process is more dispersed. However, the friend with the sunflowers stated the coloring about killed her. Ultimately, needles are poking your body repeatedly – it hurts. Your personal sensitivity to pain is the biggest decider. If you can't handle pain, don't get a tattoo. Women have a higher tolerance than pain than men do, too – even my self-described "metal-as-f***" tattoo artist stated as much. Hey, our clothing hurts – we're used to pain. Your new tattoo art will feel like a bad sunburn at first. Your skin's reaction to the process is unique. Sometimes it gets very red and puffy, sometimes it just looks a little irritated. Both are acceptable the day of. You can also expect some bleeding during the process and an hour or two after. To minimize bleeding, don't take aspirin or drink a lot of caffeine – and, again, avoid alcohol. You should worry if the tattoo feels hot to the touch, especially after 24 hours. It shouldn't be swollen after a couple hours. It should scab over but not ooze. If you think your tattoo might be infected, get thee to a doctor. Wash with antibacterial soap for the first 3 days; pat dry with a paper towel to avoid towel mold. Apply ointment for the first 3 days. Tattoo artists used to recommend Triple Antibiotic or A & D ointment. My artist suggests Aquaphor. Around day 3 gently use a fresh washcloth in the shower to remove flakes of skin from the tattoo area. Do not scrub. Do not pick at any scabs – you can remove pigment and create scarring. Use fragrance-free lotions for the first 3 weeks. I use Cetaphil. Avoid pools, spas, etc for 3 weeks. Keep tattoo out of the sun for 3 weeks; apply sunscreen religiously afterward to avoid tattoo fading. 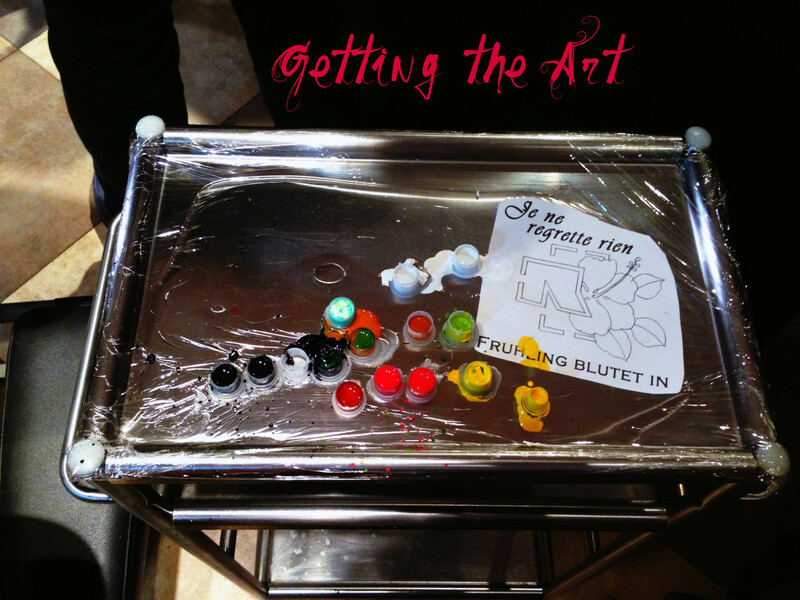 How to Design a Painterly Tattoo: Painterly tattoos mix two art forms: tattooing and painting. Choose a favorite work of art and get started. Rammstein Interpreted: Frühling in Paris: A photo essay that also offers an interpretation of Rammstein's Frühling in Paris. The inspiration for my tattoo. Getting a tattoo is a big decision, and not one to be taken lightly. You need to consider tattoo art designs, visit tattoo galleries and tattoo studios, and research your potential tattoo artists. If you're thinking of getting a new style of tattoo like the painterly style, you need to research even more carefully. 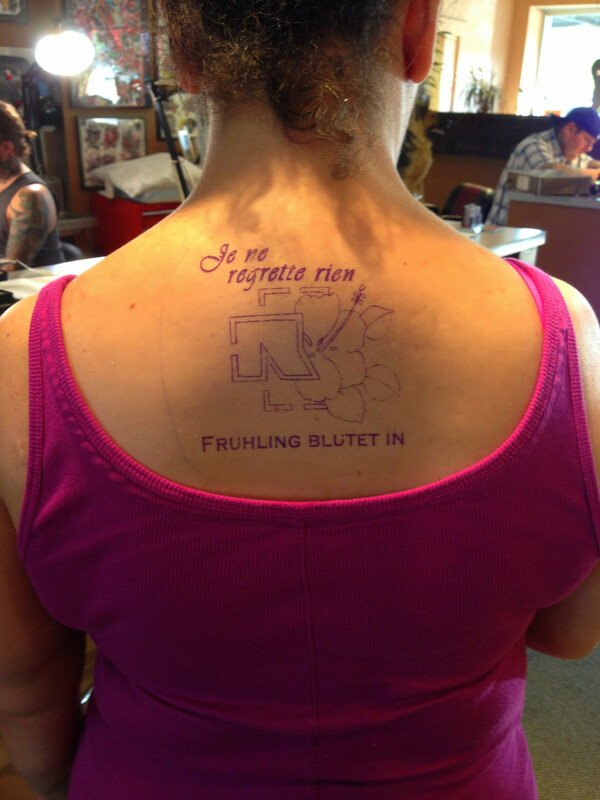 For me, because of the dichotomy of the song I was commemorating, "Frühling in Paris" by Rammstein, I wanted a tattoo that had the hard and the soft. 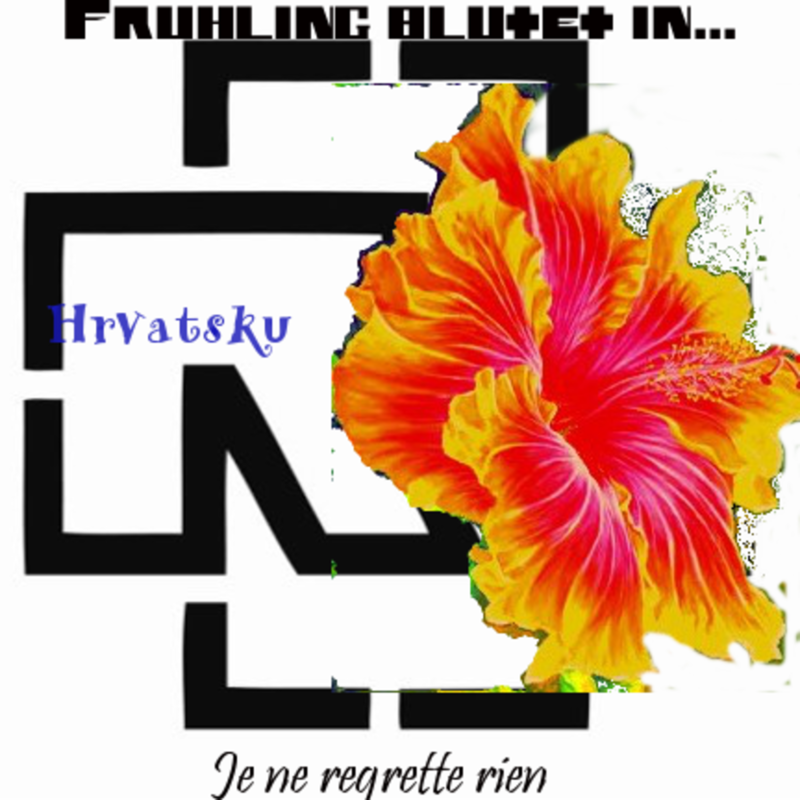 For that reason I chose to use the Rammstein logo as a frame and add a flower for the "Spring" in the song. I chose a hibiscus because they remind me of my time in Morocco. The flower is in the painterly style because I think the image makes more of a contrast to the frame of the logo. Or get the profane Mickey – as long as the tattoo has meaning for you, the tattoo art will be a welcome change to your body. It's the Rammstein logo, essentially R+. The lines relate to one of their songs. Painterly tattoos are cool! My friend recommended I get one when I was asking for design help on this one. Anyway, thanks for stopping by! 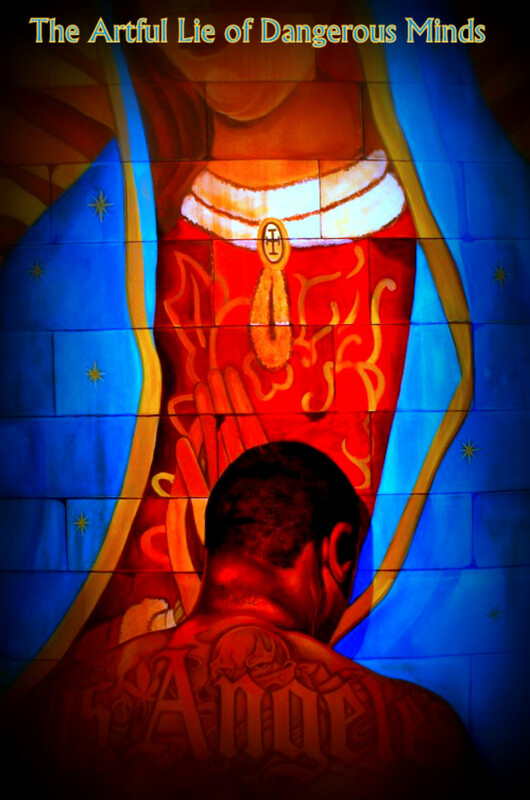 Good article, I've been researching the painterly tattoos. I was wondering what the boxy square lines around your flower are? I get the flower and the foreign phrases, but the black lines I don't get it. I actually really like your tattoo! :) I'm a tattoo person though, so to each's own. Good hub! Like I said, you're either a tattoo person or you're not -- and people have very strong opinions about them. Thanks for stopping by! Very fine piece of writing Narchuleta. I dislike tatoos intensely, but I think that your article was superior. Voted up.